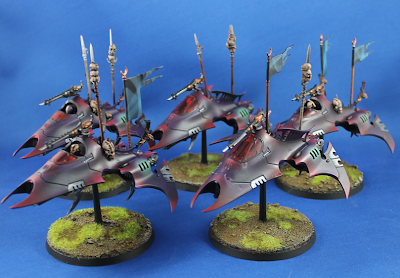 So, with the impending release of Eldar (which all signs are pointing to June) I started to look at doing a small Eldar force to accompany my Dark Eldar. 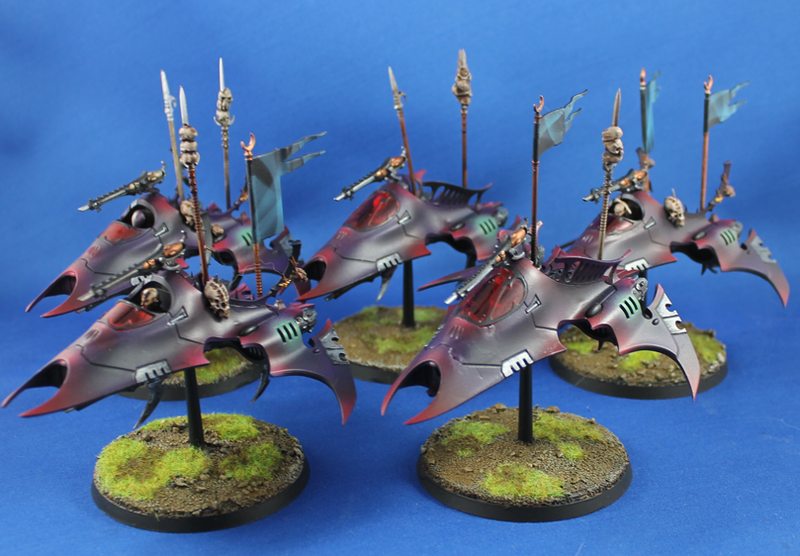 However, my Dark Eldar are a semi painted force from when they got their 5th ed book. Now, a lot has changed in my painting style, so I decided to go back to them and revisit the old Purple edge highlighting scheme. I looked at some of the older Blood Elf artwork from World of Warcraft and liked the idea of pulling two related colours together. Therefore, I decided that a black-purple and red will be the new uniform colours of the Kabal of the Sundered Sky. Here's what I got done last week; 5 venoms!